Recently, I’ve been doing some vRealize Operations Manager alarms/false positives review for a customer and noticed the “Scheduled backups are not enabled” alarm in vROps alarms dashboard. After some investigation, I discovered that the NSX manager is not being backed up on regular basis. This vROps alarm can easily be corrected by configuring NSX Manager to create backups and upload them to a FTP server. In my case I used the free FileZilla Server which can be downloaded here. Download FileZilla Server and run the installer. Install the software by accepting all default settings or change if necessary. Create a FTP root folder and a NSX Manager backup folder inside the FTP root folder. Create a new user/password by clicking the Add button. Add the directories created in step 3 in the Shared Folders page. 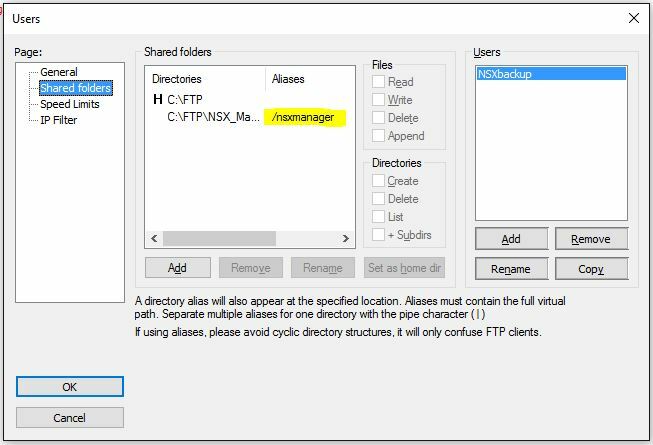 Add an alias (for example /nsxmanager) for the NSX Manager backup folder and assign read/write rights on the folder for the user created earlier. Click OK to save the new user. All done. You can leave the FileZilla Server open as you will need it later. 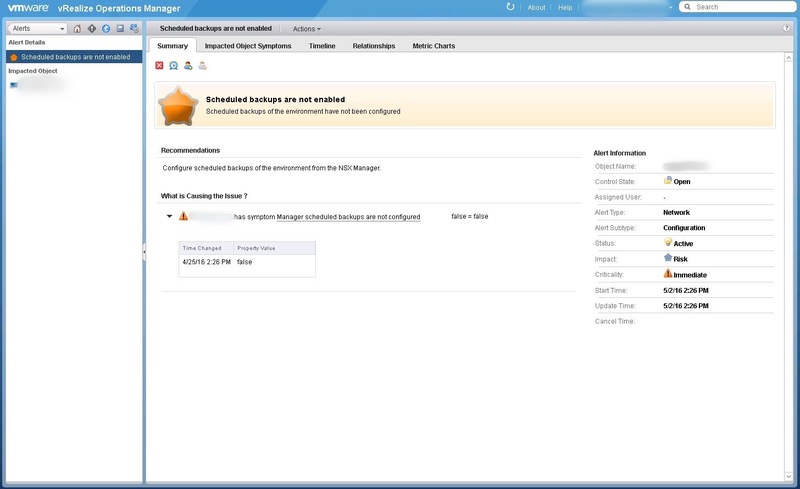 Open NSX manager and go to Backup & Restore. Click Change button on the right of FTP server settings and enter the IP/Host name of your FTP server, username and password of the user created in step 4a, backup directory which is the alias configured in step 3, file prefix, and pass phrase which is the password of the user created in step 4. Next, click the Change button next to Scheduling. Set the desired backup frequency, hour/minute of the day and click Schedule. 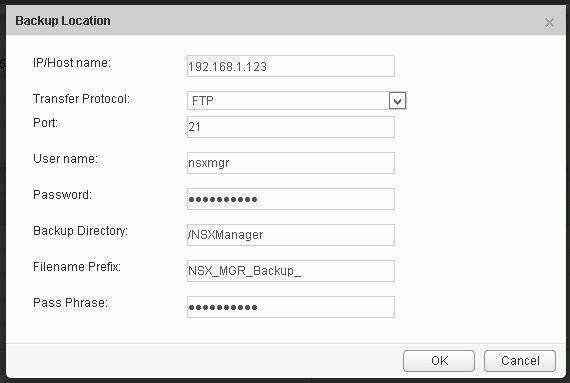 Backup NSX Manager configuration by clicking the Backup button. To monitor the progress, open FileZilla Server and see the log displayed in the main window. 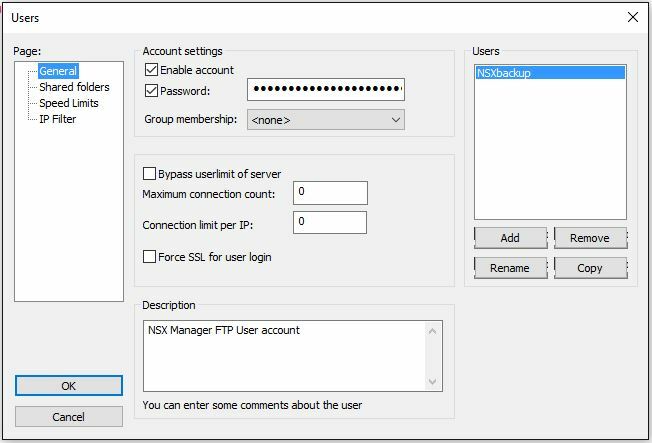 You can also check the FTP directory created in step 3 during the installation and configuration of FileZilla Server and see if the backup NSX manager files are being saved in that directory.